The opening of Book I, from the first edition of 1667. Although one can safely conclude that Milton did write in the English tongue (to be more precise, the early modern English of the Renaissance), different languages resonate throughout this epic. Biographers postulate that Milton knew as many as ten languages, among them Latin, Greek, Italian, Dutch and even Hebrew. Given this range of linguistic knowledge, it is hardly surprising to find a high level of awareness with regard to the etymology (i.e. the linguistic origins) of the words he used. But before we consider how he manipulated the senses in which he used his words, we must make a foray into biblical realms in order to understand how Milton viewed language. Samuel Johnson, in his dictionary, uses the first two lines of this quotation to illustrate the definition of the word 'word' as 'The second person of the ever adorable Trinity'.3 It is the Word/Son that actually performs God's will. The second line of this quotation can become a wider formula for the dynamic of the relationship between the Son and God: 'This I perform, speak thou, and be it done'. Milton inverts the arrangement of the identification of the voice and the spoken words themselves, thus absorbing God's voice entirely into the poetic lines. 'Sprung' is an inverted iamb, mirroring the initial inverted foot of 'Let there be…' to assert a metrical alignment that parallels the semantic and tangible fulfilment. In both the Bible and Paradise Lost, the coordinating conjunction 'and' asserts the success of this speech act, as God only has to say the words for their substance to be realised. Twice in Book VII, we encounter 'He named' (252, 274), as a synonym for 'he created'. God's naming of the world, then, is equivalent to its creation, as the very naming of things initiates their existence as realities. 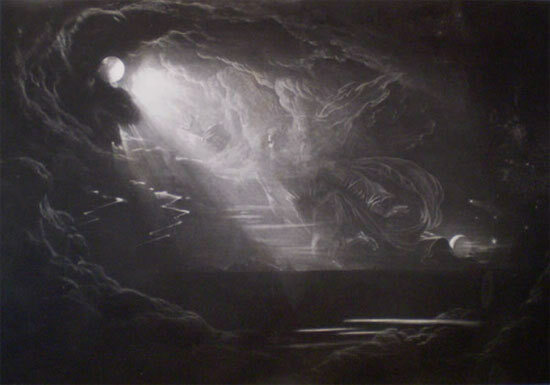 John Martin, 'The Creation of Light' (1827). Satan is an inveterate liar who abuses language for his own evil purposes. Satan's language is 'Ambiguous and with double sense deluding' (Paradise Regained, I.435), whereas the Son's language (and by extension God's) enforces a kind of linguistic harmony where 'Thy actions to thy words accord' (Paradise Regained, III.9). In Paradise Lost, Satan's 'ambiguous words' (V.703, VI.568) act as 'persuasive' traps, 'replete with guile' (IX.737, 733). He utters 'high words, that bore | Semblance of worth not substance' (I.528), and it is worth bearing this in mind should you be tempted to succumb to his enticing rhetoric, as Eve or, more recently the poets Shelley and Blake have been known to do! God's words are necessarily congruent with their meaning (God is unable to lie). But while Satan lacks the power of speech acts, he has the sophistical ability to dissemble. God's naming actually creates a thing's substance, whereas Adam only mimics this. But, naming and understanding are equated for Adam because of the crystalline clarity of signification in Eden. In defending the Latinate language used by Milton, Christopher Ricks argues for the ability of the original (often Latinate) senses of words to take us 'back to a time when there were no infected words because there were no infected actions'.5 That is, to a time before language along with mankind, was corrupted in the Fall. But it is worth bearing in mind that words have no real etymology in Eden. From our fallen perspective, we can only approximate this kind of linguistic purity as we attempt to put ourselves back in the shoes of Adam and Eve (not that they wore shoes until they were fallen, of course). While you're probably familiar with the idea of puns, it is in Paradise Lost that the so-called 'anti-pun' comes into play. This term, coined by Ricks in The Force of Poetry, describes a pun which denies rather than incorporates multiple meanings: 'whereas in a pun there are two senses which either get along or quarrel, in an anti-pun there is only one sense admitted but there is another sense denied admission'.6 The problem in Paradise Lost is that if we include the fallen meaning in Edenic puns we inadvertently corrupt the pure prelapsarian meaning. This problem has been formulated into an idea of 'reader response' by Stanley Fish in his work, Surprised by Sin. Stanley Fish argues that the reader's experience of this poem can be formulated into a well-trodden path of interpretation. He sees the purpose of this poem as educating the reader into an awareness of his own fallen position and the distance which separates the reader from original Edenic innocence. The process of reading this poem, then, is one of repeatedly falling into Milton's ready-made traps, being brought up short, our understanding being corrected, until we finally emerge a fitter, healthier reader, with retrained perspective perception. Milton in this manner trains his reader to become his 'fit audience' (VII.31). Because we are fallen, we wrongly construe Milton's words based on our own infected understanding. For example, look up the word 'wanton' in two of the places it occurs in Paradise Lost: IV.629, IX.1015. Although the word is the same, the senses in which it is used are crucially different, as I'm sure you can see. Just as man fell, so language too came plummeting down around man's ears and, just as man rose again, so language too was put back on its feet, with more than a little help from God. On the day of Pentecost, God sent the Holy Spirit to purify and redeem language from its fallen post-Babelic state of 'jangling noise' and 'hideous gabble' (XII.55, 56); the Spirit descended as 'tongues like of fire' (Acts 2:3) and mankind was once more able to understand each other and spread God's word. In the final pages of Robert L. Entzminger's outstanding book on Milton's language, he concludes that the felix culpa (or fortunate fall, an idea that celebrates the fall as the occasioning of Christ's sacrifice) is a concept which extends to language. That is to say, the fall is actually a blessing in disguise as it enabled the existence of multiple languages and sanctioned each language's own complexities and ambiguities - the very features of language which are most prominently at play in poetry. Raphael and Milton narrate 'what surmounts the reach | Of human sense' and they do so 'By likening spiritual to corporeal forms' (V.571, 573), making the 'unspeakable' (V.156) writeable through poetic means, which have been sanctified by God in order to allow man to come closer to comprehending the divine ineffable. Robert L. Entzminger, Divine Word: Milton and the Redemption of Language (Duquesne, 1985). Stanley Fish, Surprised by Sin: The Reader in Paradise Lost (Berkeley, 1971). John Leonard, Naming in Paradise: Milton and the Language of Adam and Eve (Oxford, 1990). Christopher Ricks, Milton's Grand Style (Oxford, 1963). 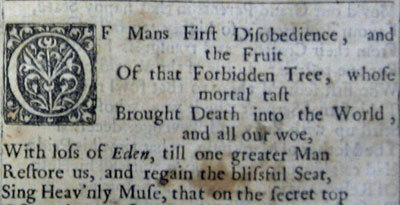 Without Milton nothing would be 'terrific', 'enjoyable', or 'enlightening'. 1 Samuel Johnson, Life of Milton (London, 1963; 1779), p. 72. T. S. Eliot, 'Milton I' (1936), in Selected Prose, ed. John Hayward (London, 1953). F. R. Leavis, 'Milton's Verse', in Revaluation (London, 1936), p.52. 2 'Omnific' means all-creating or all-making. Milton coined this word from two common Latin words. 3 Samuel Johnson, Dictionary (1755), (London, 2002). Johnson quotes Milton over three hundred times in this dictionary, more times even than he references the Bible. 4 In the words of J. L. Austin (the founding philosopher of speech act theory), a speech act is a special case where 'the issuing of the utterance is the performing of an action' (How to Do Things with Words (Oxford, 1975), p.8). He gives as examples the naming of a ship, or the marriage vows in a wedding ceremony. 5 Christopher Ricks, Milton's Grand Style (Oxford, 1963), p.110. 6 Christopher Ricks, The Force of Poetry (Oxford, 1984), p.266.